Steviol glycosides for pleasant sweetness. It is important to maintain a varied and balanced diet and a healthy lifestyle. May contain traces of crustaceans, soy and gluten. Mix 30 g (approx. 2 heaped tablespoons) of 3K Protein with 300 ml water or skimmed milk. Fill the shaker with liquid first, then add the 3K Protein powder and shake well for 20-30 seconds. For best results drink 1 - 2 portions a day, immediately after training or in the evening. 3K Protein contains casein protein which keeps the body supplied for up to 7 hours. This means it is not only ideal for endurance athletes, but also for general use before bed to supply the muscles with protein overnight. For a bit of variety we recommend whey protein after training, because it becomes available to your muscles very quickly, providing an effective, targeted supply of protein. I am in love with this Protein. I've had it as shake and mixed it into smoothies and porridge and it is always delicious. The taste is awesome and the texture as well. I've been using it almost every day. I highly recommend it! easy to prepare and actually really tasty. I ordered for the first time at foodspring and it´s really good. I like the vanilla and strawberry one. Taste and service are great. Couldn't ask for more. Great support to increase muscle mass. Who should use 3K Protein? 3K Protein is a multi-component protein consisting of whey, casein and egg protein. 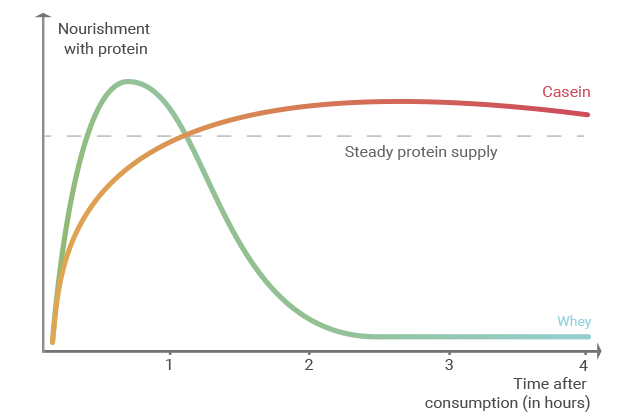 Multi-component proteins are created to maximise the organic value of different protein sources. This helps achieve maximised bioavailability in the body, meaning our body can efficiently convert the protein supply into the body's own proteins. Combining different sources of protein also creates a complex amino acid profile which is ideal for muscle building processes and an immediate supply for workouts. Why is 3K Protein made up of whey, casein and egg protein? Whey protein is a part of milk protein. It represents the largest portion of our multi-component protein. Due to its immediate availability to the body it is valuable after every kind of training. Casein protein, is also a part of milk protein. It is a so-called "slow" protein which takes 7 hours before it is completely metabolised by the body. Therefore Casein is ideal for providing the body with a long-lasting supply of protein. The amino acids reach the muscle cells slowly and continuously, thus supporting anabolic (muscle building) processes. Egg protein, or egg white, is often used in the production of multi-component protein products as it significantly improves the amino acid profile. Eggs have a organic value of 100 which means they can be converted into body protein very efficiently. The amino acids contained in 3K Protein are important for muscle building processes. The best known essential amino acids that are relevant for building muscle are the BCAAs. The Branched Chain Amino Acids (BCAAs: leucine, isoleucine and valine) become available to the body very quickly and can be metabolised directly in the muscle. Non-essential amino acids are also very important for intense workouts. They promote muscle growth and maintain muscle definition. A study of 24 athletes published in the Nutrition Journal found that supplementing your diet with multi-component proteins with a high whey protein content can significantly increase not only muscle mass, but also strength and energy. Furthermore, the casein content in 3K Protein is perfect for putting a stop to catabolic processes (processes which break down muscle) which occur as a result of a lack of a protein supply over an extended period of time. Casein protein supplies the body with a continuous flow of protein elements for up to 7 hours, which it can use for building and repair processes. In the context of the effects of the 3K Protein the term organic value comes up a lot. The organic value indicates how well the body can convert proteins from food into the body's own proteins. Nutritionist Karl Thomas believed that egg contained the highest possible organic value and gave it the value 100 as a benchmark for all other foods. Today, many years later, we know there are other foods with a much higher value than 100. These include whey protein with a value of 104 - 110. Multi-component proteins like 3K Protein have a high organic value of 115 - 125. The amino acid combination of the proteins in 3K Protein is perfectly balanced and can therefore be absorbed perfectly. 3K Protein is suitable for athletes who want to reap the benefits of a high organic value and multiple sources of protein in one product. 3K Protein is suitable for power athletes and endurance athletes alike because of its balanced amino acid profile and the combination of 3 sources of protein. 3K Protein can be taken anytime because of its complex amino acid profile and the functionality of the protein combination. The protein is probably best taken first thing in the morning or after training because of its high whey content. Your body will then receive all the premium nutrients it needs during anabolic (muscle building) phases as essential amino acids, which promotes muscle growth. The casein protein content means that 3K Protein can also be taken in the evening before you go to sleep. Casein is delivered to the muscle cells gradually and uniformly via the bloodstream and takes 7 hours to metabolise completely, providing a constant supply of nutrients overnight. 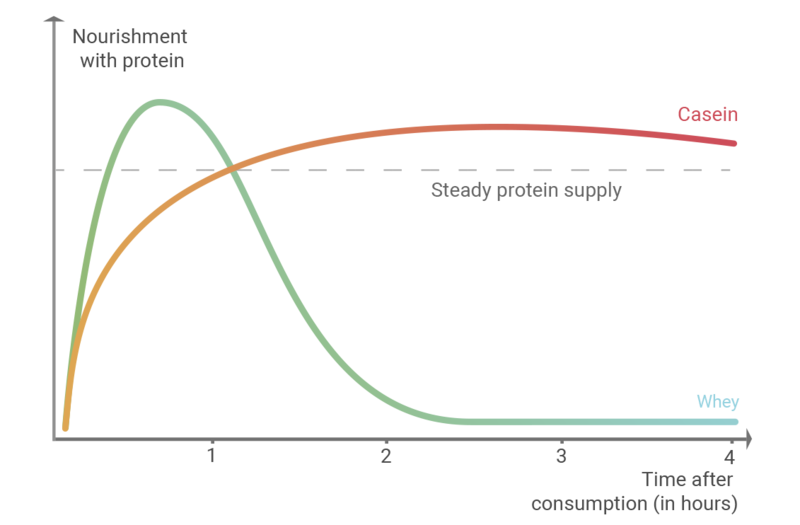 Catabolic processes are prevented and protein biosynthesis (muscle building) can continue without interruption. But the secret to long-term muscle building is not only supplying the body with protein shakes - you also have to coordinate your diet and training to achieve your physical goal. Integrating high-protein foods into your daily diet ensures that your body has a constant supply of protein elements for maintaining and building muscle. High-protein animal products include lean meats, fish, quark and yoghurt. Plant-based sources of protein include red lentils, kidney beans, quinoa, peas and nuts. You should have a good mix of plant and animal protein sources in your diet to stay fit long-term. People with severe lactose intolerance may experience stomach pains and digestive discomfort when taking 3K Protein. We recommend switching to our Vegan Protein made from peas, rice and hemp. Fluid intake is also immensely important when increasing your protein consumption. If you consume 1.3 - 1.8 g of protein per kilogram of body weight per day, you should drink at least 2 - 3 litres of water. Insufficient fluid intake can result in headaches and tiredness. When purchasing a multi-component protein like 3K Protein you should ensure that the protein sources are combined in such a way as to maximise the organic value. A high-quality protein should use at least two protein sources and have an organic value of at least 110. A protein of this description will have a high level of bioavailability for the body and will make an ideal supplement for training or for muscle building. However, the most important aspect to look out for when buying a multi-component protein is the use of high-quality raw materials and certified manufacturing processes. 3K Protein by foodspring is manufactured in Germany using the finest ingredients. 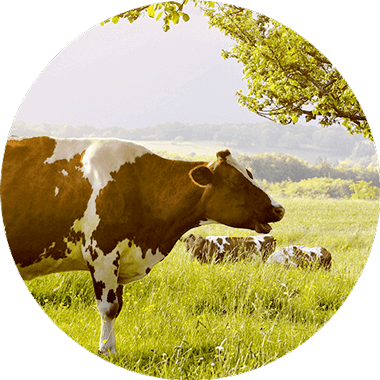 We use pasture milk for our proteins, a raw material with special premium features. You can buy high-quality 3K Protein directly from our online shop. Why combine whey, casein, and egg protein? The use of these three highly valuable protein sources strongly enhances biological value and provide muscles with all the essential amino acids. Combining these three ingredients delivers high-quality proteins over both the short and long term. Whey provides the body with valuable and quickly available proteins immediately after exercising. It supports fast, efficient muscle building in particular. Casein keeps the body supplied with protein for up to 7 hours. This means that support for muscle building lasts long after a hard workout or protects muscles from being broken down over night. Egg protein rounds out the amino acid profile of our 3K Protein and provides optimal bioavailability. 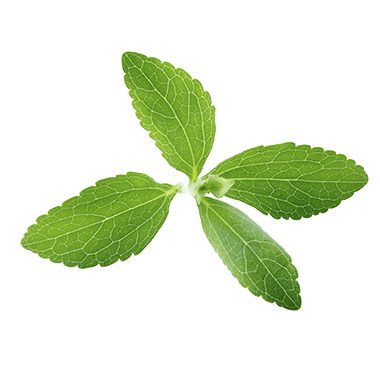 The stevia plant offers the opportunity to create a highly valuable sweetener. Steviol glycosides are purified extracts of the stevia plant. They make it possible to avoid unnecessary carbohydrates and do not effect the calorie count. This makes steviol glycosides far superior to traditional industrially-produced sugar. For which sports is 3K Protein a good match? 3K Protein is ideal for both muscle building and muscle definition and can be used for all sports. Whether you are looking to improve endurance, build muscle, or simply stay fit, the protein combination of high-quality whey, casein, and egg protein is an ideal, quick way to provide the body with long-term, readily available protein. With 3K Protein, the body can repair muscles and ramp up faster for the next workout. What are the key qualities of 3K protein by foodspring? The different protein components in our 3K Protein are perfectly combined. The whey protein, comprising 72.5% of the 3K Protein, is based on milk from pasture-raised cows that mostly eat natural grass. This high-quality raw material provides your body with effective support in muscle building. Because if a cow is happy, its milk is healthy, too. At the same time, we are showing our commitment to animal welfare. 3K Protein will be back in stock shortly.